What do you think of these songs? Do you agree with the words to the following songs? We would love to hear what you think. 65 comments to Is the JW Songbook Really Singing Praise to the Faithful Slave (Governing Body)? I have them on a cd that I downloaded before the change of words. Thus strengthens us your will to do. here is one from 1908. Happy service, blessed service, when we labor for the glory of our king. Happy service, blessed service, and for joy of heart his servants sing. Do a search on songs of Jewish worship. Many beautiful ones, but I must warn you. Moses, Ezekiel, the bride, the temple and a few other things are in them. Why one alone was on the bride. Paul Wilbur did most of the singing. A lady sang the first one. Witnesses are told not to endear their hearts to any object of thing, ie flag, pledge but are encouraged to do just this to these men. Hardly any Christian religions would do such a thing in songs of praise to Jehovah. But as you mentioned Jewish songs might but the Jews are not the touchstone here, as of now blindness has been allowed with the Jewish nation until in the future they will accept Christ but not now, they are mostly secular. On facebook we are having a conversation and they want to know what is the publish date of this song book? I need to go find mine. I left in 2009 but never sang from it as the harmony was off and my husband didn’t like the words so we hummed. Just found it by pulling up the book 2009 is release date. I never sang from this one.Glad I didn’t as they would have probably disfellowshiped me for pointing out the errors in praising men rather than Jehovah. Peter, yes it did effect me as i was used to those words, I love the word of Jehovah and i still listen to the kingdom songs all the time, it has a very calming effect on me. Doug – Thanks. Do you mean that you were used to the words in the older songs and enjoy listening to those? Or do you like the new songs with the word changes referencing the Governing Body just as well? No judgement here. I just want to understand you. Thanks. Doug, I have not liked the song book since the old green paperback from the forties, lol. The pink one was sort of okay, but when the Negroe spirituals were taken out they lost me. Those spirituals were directly in praise of God for there was no one to help them and they sang to the God of Heaven basing it on the psalms of David mostly and the pleads of the Israelites. Lori hello my facebook friend! I am speechless that they would mention themselves in songs of praises to our almighty God, Jehovah. And it is a shame also that a lot of religions won’t use God’s name because people might associate them with the witnesses and the witnesses just don’t have a good name anymore. I would be afraid if I were these men but they have always affronted Jesus but I am in shock that they are doing this to Jehovah, wow. Have they changed the songs in recent years??? I don’t recall this from ‘back in the day’, I left in 1992. Wow!! They SING PRAISES to the organization, to the so-called faithful & discreet slave! Truly worshippers of the Watchtower Organization instead of worshippers of God! It is to God and Christ we should be singing praises to, NOT men!! Shocking!! Hi Sally, I never really used the new song book and I left in 2009. But when Br. Peter wrote this article I said now I know why they changed the song book. I always wondered why they changed, now I see. I need to find mine and look thru it good. Also they are writing articles about the life of each governingbody member taking up 20% of the watchtower. They never did this until they were dead a bit. Something is so wrong and all of my family is in it and wouldn’t think about looking closely at the songs. They are writing articles about the governing body members in the pages of the Watchtower?? What ever happened to them not being known? Now they seem almost to be delighting, reveling in the limelight like celebrities! Truly looking for and delighting in the adoration of millions! Truly it is becoming more and more apparent that they are worshippers of men, and of an organization not of God! I find it shocking how many do not know what the watchtower teaches! They say the wt teaches that salvation is by means of faith in Christ, which while true, is NOT what the org. teaches, when I post quotes, they call me a liar! When we show them Jesus is NOT their mediator, they call us liars!! They have NO idea what the org really teaches!! We are trying SO hard, to open the eyes of so many. How sad it is to see these things taking place, who would have ever thought?? Sally Peterson – Thanks for your comments. You said, “They have NO idea what the org really teaches!” That sounds interesting. Can you elaborate? Thanks. In speaking with Jehovah’s Witnesses it is indeed shocking that so many are completely unaware of some of the teachings of this organization. Most notably, they believe the organization teaches that salvation is by faith in Jesus Christ, while this is true, according to scripture, this is NOT what the organization teaches! In many of their quotes it is made quite plain that it is the organization that saves. The many outside the organization who have complete faith in our Lord and Savior have no chance of being saved because they are not members, this according to the watchtower. Also most seem unaware that the organization teaches that Jesus Christ is the mediator only for their 144,000, not for the great crowd. This is NOT true of course, as scripture plainly tells us, there is One Mediator between God and men, this however is NOT what the organization teaches. Also many seem to think the organization Still claims to be inspired, however according to the latest quotes, they are now claiming to be uninspired. Apparently those of us who have left the organization seem to be more aware of what the organization teaches than their many members. So very sad. Sally I agree with everything you say and I find it shocking when I try to talk to a witness. My family that I love, the one I came out of haven’t a clue. I want to tell them but it scares them, I see in their face and have to stop. They don’t want to stop talking to me and it scares them that they might be causing their children to die or that they won’t be resurrected to see our parents. I leave them alone. Here is another one. My father died disfellowshiped as he didn’t agree with the blood issue and took it. He absolutely refused to be reinstated on his death bed when they came. He felt he had a better chance if he wasn’t connected to KNORR They told 9 children that we would never see him again because he died DF’d by the men. MY ELDER GROWN BROTHERS and sisters believe this as of last week. I refuse to mention the bible to relatives again as it is so disturbing within me. I will just leave this to Jesus when he begans his infusion of knowledge to all mankind. Any time my speech was contrary to the accepted public belief of the WT, i remember the words to me…”Get behind me Satan!” There is official doctrine & unofficial, behind the scenes. When i was a member we were trained on how to give a particular answer in a certain way which wasnt really truthful, wen u think about it.They trained us that its not really a lie to a person who duznt hav the right to know something. If we wood deviate from the right words or phraseoligy….either the elders wood follow me, pushing up on me, listening to every conversation at the meetings, talk about awkward! Then subtle threats or more direct threats to recant(repent) or b disfellowshipped, or judicially handled.Im recalling this from my personal testimony. Personally I feel that ALL praise belongs to Jehovah & Jesus Christ! No glory should be directed toward the Governing body (faithful & discreet slave), these are mere men & not our saviors! All the songs should only be glorifiying Jehovah, even Jesus would alway give glory to his Father in the heavens. I have noticed some time ago that words in a lot of kingdom songs have been changed. Doug – How do you feel about the changes in the words of some of the songs? Did it matter to you? Did you give it much thought then? How about now? I left in 2013. Let me say that this new song book would bring tears to my eyes & heart when singing. It was very moving! For me it was the beat, the music that touched me & a combination of certain wordings about Jehovah. When it came to songs such as these…bringing honor & glory to the Governing Body, we would hear this repetitively throughout all meetings, either thru songs, thru parts on the meetings, thru literature we’d read, or thru listening at the assemblies, conventions, schools for Ministerial Servants & Elders, etc. Hearing something thousands of times over & over has an effect on weak minds. One starts to believe it after some time. I found myself in the same boat. I figured it was appropriate, we all felt that way. But being broken from the control I can now see in hindsight it is definitely inappropriate. 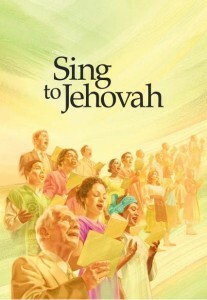 We should be singing songs of Praise to Jehovah God and his Glorious Son Christ Jesus. Just look at the cover title. He should be the focus.